In 1950 Karlheinz Stockhausen was accepted into Frank Martin's composition class at the Cologne Musikhochschule. The relationship was not a success, Stockhausen had only a few hours of tuition with Martin, and most of this was spent analysing his teacher's own compositions. More Frank Martin down this path. Two years later Stockhausen started studying composition with Darius Milhaud in Paris. But once again Stockhausen was dissatisfied with his teacher, and after a few weeks he stopped attending Milhaud's classes. 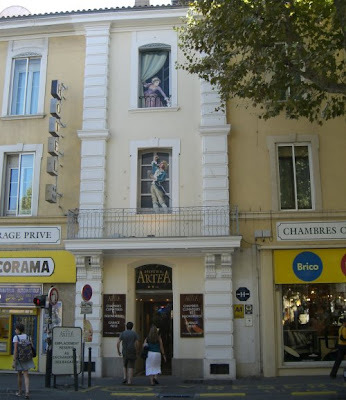 My photo above shows the house that Milhaud was born in at 4, Bd de la République, Aix-en-Provence. His birthplace, which I visited in September, is now the Hotel Artea and not a museum. There is a discount if you check-in after 8.00pm, which cannot be said for many composer's birthplaces. Milhaud's other pupils at various times included Philip Glass, Steve Reich and Burt Bacharach. Alvin Curran was not among them, but there are connections. Aix-en-Provence supplied my recent Inner Cities photos, and from 1991 to 2006 Curran was Milhaud Professor of Composition at Mills College in Oakland, California. This Chair was endowed in memory of Milhaud who taught there after being forced to leave France in 1940 because of his Jewish backgound. Milhaud's Jewish ancestors had lived in the ghetto in Cavaillon. This town is close to Avignon, sometime home of the Popes, which is where Stockhausen's third teacher, the devout Catholic Olivier Messiaen was born. Olivier Messiaen was born on December 10, 1908. His birthplace Avignon is only a short distance from Milhaud's in Aix-en-Provence. In fact all my paths converge in Avignon as the city also has connections with Pierre Boulez, who was another pupil of Messiaen and a colleague of Stockhausen. The work of Messiaen, Stockhausen and Boulez also converge in London in one of the highlights of 2008, which is, of course, Messiaen's centenary year. 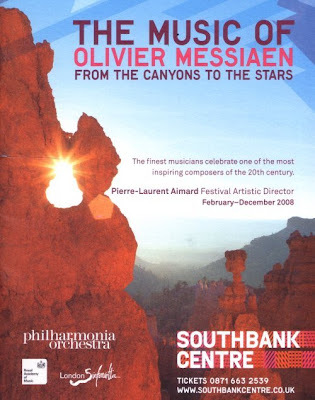 The event is the Southbank Centre's festival The Music of Olivier Messiaen - From The Canyons to the Stars. If anything was to tempt me to move back to London it would be this year long feast of twentieth-century music. Full details here, and below are some of my personal 'must attends'. * February 7 - Southbank Gamelan Players followed by Messiaen Turangalîla-Symphonie with Philharmonia Orchestra conducted by Esa-Pekka Salonen. * February 13 - Messiaen Vingt Regards sur l'Enfant Jésus played by Pierre-Laurent Aimard. * February 15 - concert by Royal Academy of Music Manson Ensemble including Stockhausen Kontra-Punkte and Xenakis Jalons. * February 17 - must be THE concert of 2008. Boulez Rituel in memoriam Bruno Maderna and Messiaen Et exspecto resurrectionem mortuorum with London Sinfonietta conducted by Peter Eötvös (who is one of the conductors of Gruppen in my Future Radio webcast this Sunday Dec 16). * May 1 - Ascension Day service in Westminster Abbey including the organ version of Messiaen's L'Ascension. * May 11 - Pentecost Mass including movements from Messiaen's Pentecost Mass for organ, Gregorian chant and Victoria's Missa Dum complerentur. * October 20 - organ recital in the London Oratory that includes a rare chance to hear the Kyrie from Satie's Messa des Pauvres, and movements from Tournemire's L'Orgue Mystique. The Satie fragment was composed for the church that the composer founded, and at which he was the only worshiper, the Eglise métropolitaine d'Art. * Centenary concert Dec 10 - Messiaen Couleurs de la cité céleste and Sept Haïkaï, Boulez sur Incises with Ensemble Intercontemporain conducted by Pierre Boulez. Now playing - Messiaen's Des canyons aux étoile (From the canyons to the stars) on the double Apex CD with Yvonne Loriod-Messiaen, and Ensemble Ars Nova. The couplings are Messiaen's Hymne au Saint-Sacrement and Les offrandes oubliées, the sound is excellent, and there are decent sleeve notes. You can buy it from Amazon resellers for not much more than a Starbucks latte. What can I say, other than ask that seasonal roast chestnut? - is recorded classical music too cheap? I wrote recently about how so many composer's names begin with 'B'. To prove me wrong Stockhausen's teachers all began with 'M' - Martin, Milhaud and Messiaen. Coincidence or part of a cosmic plan? OMG, we'll have a Messiaen year next year? Where can I emigrate to? Dave Brubeck was also one of Milhaud's students. Brubeck even named a son after him. Alas, I won't be able to make it across the pond for any of this, but I'd love to have a copy of that promotional poster for my studio, which is something I'm usually not prone to collect. (mixing Messaien and what looks like Sedona, AZ- how could I not). It's actually Bryce Canyon in the photo used for the poster, the rock formation that looks like a cup above the h in Southbank is the giveaway; Messiaen, of course, visited Bryce Canyon, which is mentioned in the 7th part of Des Canyons aux Etoiles. Good program at the Southbank Centre; I'll have to content myself with the Los Angeles Philharmonic/Esa-Pekka Salonen doing Des Canyons aux Etoiles in January. The New York City Opera is doing St. Francois di Assisi in Gerard Mortier's first season, 2009-10. Amazing how often Des Canyons aux Etoiles is being performed as of late. Keith Lockhart and the Utah Symphony played it earlier this year in its first performance in Utah. I found it slightly ironic that a piece with so many references to Utah took over 30 years before it was actually performed here!